The times they are a-changin’ and there’s a crispness in the air that warns snowbird RVers everywhere head south now before it’s too late. If you’re done with long, cold winters and yearning for a better way to live between November and April, you’re not alone. 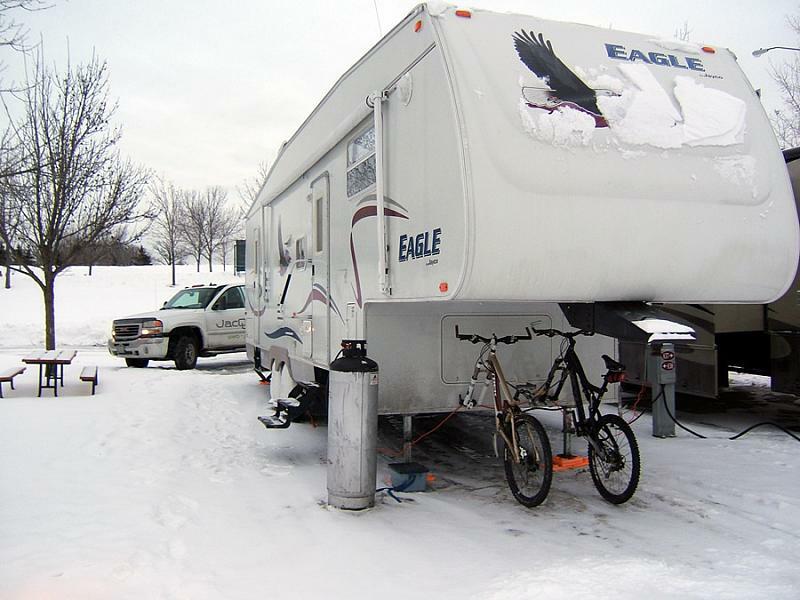 Each year millions of “snowbird” RVers pack up their RVs in search of a warmer way to spend winter. Some people think that being a snowbird is only for the most wealthy RVers of the world, but they’re wrong. These three reasons explain why RVers who plan ahead can head south for winter, even when cost is a major concern. According to petroleum industry analysts, gas prices are generally lower in winter than summer. RVers who flock to snowbird states like Florida or the Gulf Coast will experience the cheapest gas in the nation. Your biggest expense will be paying for your RV spot through winter. If your only goal as a snowbird RVer is to escape cold temperatures, staying in one spot is cheaper than moving around. This is especially true in East Coast states like Florida, where park rents are much higher than in the more sparsely populated west. If you research now and plan ahead, you can discover that many snowbird RV parks offer great seasonal deals. For example, if you commit to staying three months or more, you’ll enjoy cheaper campground fees than the casual visitor who only stays a week or a month. Snowbird RVers who follow a western migration always enjoy more budget-minded camping choices than their eastern counterparts. Warm destinations like Southern California, Arizona, and New Mexico have millions of acres of public recreation lands with camping fees that don’t break the bank. FEES / PERMITS REQUIRED: A Long Term Visitor Area Permit is required from September 15th through April 15th each season. The cost is $180.00 and is valid for up to 7 months. A Short Term Permit is available for a 14-day stay. This permit is $40.00. Permits may be purchased on site or at the BLM Yuma Field Office. The best way to enjoy snowbird camping in the country is by investing in a good RV solar electric system so you can boondock in beautiful places. New technology such as lithium batteries for your RV make it easier than ever to stay powered up when off grid. Even if you don’t go solar you can still boondock affordably. Just be kind, and don’t annoy your neighbors by keeping the generator on all the time. Talk to other snowbirds and you’ll find lots more reasons why heading south for winter makes sense. As daytime temperatures dip and layers get added to your wardrobe, now’s the time to make your move. Plan wisely to migrate south with snowbird RVers and you’ll never suffer through another long, cold winter again. Consider work camping. We are at the National Key Deer Wildlife Refuge on Big Pine Key, FL for three months . We receive free camping in exchange for 24 hours a week of volunteer service. We are seeing and experiencing things we never thought possible. I like this idea! We had a very difficult time finding a place to stop when traveling to Texas by car, pulling a boat, this past summer. We wanted to camp and sleep in the car but the RV places were alway so full. We ended up in hotels which was expensive. Next year we will have our trailer so we can boondock when there is no room, and stay in the more deserted RV parks in the winter! Thank you! Most of the gov parks book pretty quick but the private parks usually will have openings. Im in Trenton fl. at Otter Springs and there is always openings because they are not listed on reserveamerica site. There was several people i talked to last yr. and all said pretty much same thing that everything is booked on that gov site. if u decide to go to Otter Springs let them know chris sent u, I might get a discount. Also look on yellow pages site to get listings for the town u want, this will help a great deal. Florida’s population increases by 40% from October to April, its in-season so pices are up. Traffic is horrendous not just from RV’s but snowbirds with Condo’s or second homes. Camprgrounds are packed and spaces are tight. Not all that dreamy as you make it sound. I live here normally do I do see the differences.